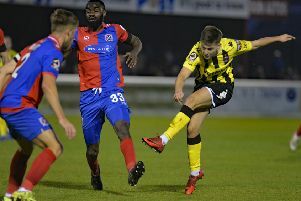 For the first time this season AFC Fylde are bidding to bounce back from successive National League defeats, though manager Dave Challinor says there is no need for any kneejerk reactions. Those 1-0 losses to Leyton Orient and Guiseley have seen the Coasters slip two places to ninth. However, victory over Dover at Mill Farm tomorrow would move them back in the right direction by overtaking the south coast club, who have replaced Fylde in the final play-off spot. Challinor told The Gazette: “It’s just the next game. Playing a team in and around you it’s a chance to pick up three points and deny them the three, but what is important is that we get back where we want to be. “I think you have to go back to 2014 to the last time we failed to score in consecutive league games and we have to put that right. “We had opportunities in both games. Leyton Orient defended well, were well organised and we didn’t put them under enough pressure. After an outstanding run which yielded 19 points out of a possible 21, Fylde have won one game in five but Challinor does not feel there has been any loss of momentum. “I don’t think the performances in the last few games have been a whole different to those in the winning run” he explained. “I don’t think we’ve ever been in form or out of form. It’s just the nature of this league that all the games are closely fought. “We’ve been in virtually every game and only twice have we lost by more than one of goal – and one of those was when we had a player sent off early against Maidenhead. We always know we’d lose games in this league. Did I expect to get so far into the season without losing consecutive games? No. Fylde can still boost their squad this season, not that Challinor is anxious to do so for the run-in. He added: “We are constantly looking. It’s mainly with a view to next season but you’d be daft not to look to improve your squad this season if the opportunity is there.